If Sodium Benzoate and Vitamin C can form Benzene in soft drinks can they form benzene in a cosmetic? Benzene is a known human carcinogen. It is ubiquitous (found everywhere) in the air thanks to pollution caused from the burning of fossil fuels, wood smoke, various manufacturing processes, car exhausts and cigarette smoke. In case you were wondering the burning of wood contributes to no more than 2% of the total. 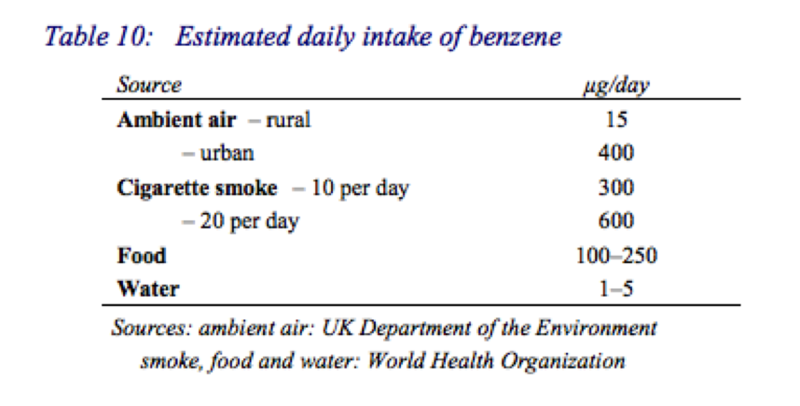 The toxicity of Benzene has been studied and reported on for decades and industrial exposure limits to exist with ‘safe’ levels in air, leaving a decent enough safety margin calculated at around the 5 ppb (parts per billion) although there appear to be a number of different ways of reaching a ‘safe’ or ‘tolerable’ level and I’m not that sure we have a global consensus on this. And it is not just air that exposes us to Benzene. As you can imagine benzene that is present in the air cycles through the environment and can be found in food and water – yes, that’s any food and water, quite possibly even that grown organically if it happens to be under a flight path, near to a power station or even a normal country road. So the above highlights the fact that thanks to modern living the carcinogen Benzene is in our food, water and air and while this realisation isn’t all happy, happy, joy, joy at least we can rest assured that big brother is watching out for YOU when it comes to your general exposure. But what about benzene that is CREATED in a consumer product? Well that very situation came to be headline news back in 2005-2006 when the FDA were handed a report created by a private lab detailing benzene levels in soft drinks. Now at the time there was no standard on Benzene in soft drinks because benzene isn’t put into soft drinks, water, sugar, flavour and preservative are put into soft drinks. Water, being the largest percentage input of a soft drink and most likely to contribute to benzene levels WAS and still IS regulated – 5 ppb max – and so it was with some surprise when reports came back showing drinks with over 70 ppb benzene present!!!!!!! WOWZERS. Now before we get all flustered I have to say that further reading (and it always helps to do some further reading) showed up some potential issues with the original data in as much as the method used for preparing samples for analysis was potentially elevating benzene levels in the test samples. Alternative methods were investigated so as to give a more realistic and accurate picture of what is going on in the cans and bottles of the world and the testing was re-done. I do love the way the FDA investigates stuff. Most of the time. But even with the test method issue there was benzene present in a significant level of soft drinks above ‘safe’ levels and that had to be investigated. The cause of this benzene wasn’t too hard to pin point. The drinks containing Sodium Benzoate – a commonly used preservative, and Ascorbic Acid – a commonly used anti-oxidant – recorded the highest levels. This is because these two ingredients can react together to form benzene. Ascorbic Acid is a powerful reducing agent, it works brilliantly well at that when the pH is above 4, a beverage is usually around pH 6-7. Further more this reaction is catalysed by free radicals, ascorbic acid is an antioxidant that scavenge free radicals but it is also not very stable its self and can actually release free radicals too. That plus Sodium Benzoate which is also fairly prone to changing into Benzoic Acid or further to benzene makes for a perfect storm. The issue highlighted above with soft drinks was solved with a bit of re-formulation involving the addition of chelating agents and additional antioxidants to help retard free-radical formation. In addition packaging choice and storage conditions were better controlled. This isn’t a new issue and many people have blogged about this before even so I haven’t yet found any papers relating specifically to the formation of benzene in-situ in a cosmetic product. Now that may be because I haven’t looked hard enough and so once I’ve published this, got on with my other work then had a cuppa I’ll resume my search. My thinking is in line with other chemists that I’ve spoken to on this in that yes, sodium benzoate plus ascorbic acid in a cosmetic formula could produce benzene. Now whether that reaction would be far-reaching enough to leave the product effectively preservative less (Sodium Benzoate is used as a cosmetic preservative) meaning that it would fail micro testing and not make it to market or through stability is up for debate. I would have thought so. Also it is highly likely that the colour change reaction in the vitamin C would be enough to prevent the product being retailed but again I’m only speculating. The fact that both sodium benzoate and Ascorbic Acid are both generally present in much higher concentrations in a cosmetic than a beverage is relevant as rather than make the product more likely to be benzene-rich the extra material might well shield the reaction and make the formula altogether more stable. In addition the fact that a well formulated cosmetic product should be utilising an effective chelating agent could also further slow down reactions gives me some hope. But on the down side a cosmetic formula is likely to be exposed to air (oxygen, needed for oxidation and free-radical formation) for much longer periods of time than a can of drink and as such it is feasible that benzene levels could increase over the life of the product. One would have to run tests to find out. Those tests might be around $300 per sample and typically 3 samples per test point would constitute a pilot study so finding out definitively if this is an issue isn’t exactly cheap. It might be. Probably for those products most at risk. The skin is permeable to benzene – a relatively small molecule with good penetrating ability across intact skin. The above data is cited in the paper ‘percutaneous penetration of benzene in hairless mice’ by the American Journal of Industrial Medicine in 1985. Looking at that we can see an absorbed dose ranging from 0.07-0.17% of the applied dose. Basically that means that more than >=99.83% of the benzene you put onto the skin fails to make it into the body. Relatively good news but is it good enough? If a terribly unstable cosmetic contained as much benzene as was found in that initial study – 79.2 parts per billion. And we were to slather it onto our faces once a day we might end up absorbing 0.134 parts per billion of the applied dose. If we used it twice a day that would rise to a worst case scenario of 0.269 parts per billion of the applied dose. That’s as far as my math goes and maybe I’ve missed the point a bit. But my logic says that if the rate of exposure through the skin is 1% of applied dose whereas the rate of exposure via the mouth is 100% then a cosmetic product that meets the food regulations should be very safe. So should you avoid cosmetic products that contain vitamin C and Sodium Benzoate? Well, the temptation is to say ‘yes’ just in case there is a problem but we must remember that we are talking here about Sodium Benzoate and Ascorbic Acid. Vitamin C comes in many shapes and sizes in a cosmetic formula and in terms of reactivity ascorbic acid is way more volatile than some of the other commonly used types. So no, I wouldn’t make such a sweeping statement. Some ingredients we use in cosmetics already contain benzene rings – some surfactants and plenty of plant based ingredients to name but a few. I doubt these would contribute to free benzene in a formula as the benzene is far too busy and cozy in its molecular home, but I am potentially concerned about ingredients like Arbutin / Hydroquinone which have a much freer structure and are more prone to oxidation. Then there are ingredients like some carbomer grades which use benzene as their polymer catalyst and as such may have traces of free benzene left. These levels are kept to a minimum but it is worth considering when, as a formulator you are assessing the potential risks posed by any oxidative stability of your product. Here is some data from Lubrizol on their carbomers. ← What the sugar issue has taught me.